Digital Relevance is a marketing agency that generates great content for their customers and does PR campaigns with influential websites in their niche to promote this content. This strategy gives them great visibility, brings targeted visitors to their website and earns them links. As a result, they have grown by 3596% in the last three years. In this article, based on a great interview done by Trent Dyrsmidt on Bright Ideas, Aaron Aders, co-founder of Digital Relevance, shares what is working best for them to convert their prospects into customers. He explains, step by step, what they do once a prospect gives them their contact details and enters into the marketing funnel. Digital Relevance uses HubSpot as marketing automation software. This software sends emails and content and tracks the customer’s behavior. Which is your most important online marketing priority? Which is your top online marketing metric used to gauge your performance? What’s your top performing online marketing channel? What’s your lowest performing online marketing channel? What online marketing channel do you believe has the largest opportunity for improvement? This is the information that Digital Relevance considers relevant to classify leads. AIt allows them to evaluate which ones could benefit the most from their services. When leads fill out the first questionnaire, they are sent a second questionnaire that asks for more questions. Other agencies that want to follow a similar approach should formulate their own questions to assess the value of a lead. A lengthy questionnaire will bring lower response rates. Once a lead fills out all this information, they enter into a funnel. When a lead is at the top of the funnel, the agency sends them general industry information, content, and specific techniques. 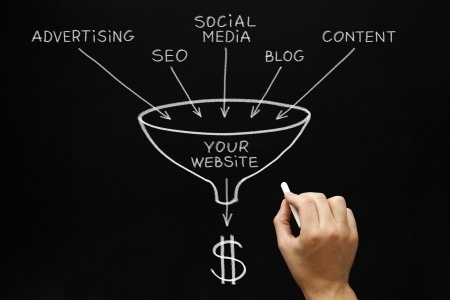 When a lead gets to the middle of the funnel, they receive further education about marketing techniques and services that the agency provides. At the bottom of the funnel, prospects receive more specific information on exactly what the agency does and can do for them. This is the part of the process where the agency closes deals. The idea of a funnel is very important. The objective is to thoroughly understand what a lead really wants or is interested in. The first signal is what guide he is clicking or downloading, which is fully tracked. If, for example, they download a guide about link earning strategies. The prospect will go through a specific series of emails, related to what they downloaded. If this person downloaded a guide about Click-Through Rates, he would get different types of emails, related to Click-Through Rates. The agency closely monitors how prospects react to the different emails, what they download, and what they click on. This process gives each lead a score, managed by the software HubSpot. They end up contacting those leads that have the highest score. This will help them be much more effective and close more deals, with less effort. As a consequence of this approach, they got a 3596% growth in the last 3 years. Are you an agency or a PR / Marketing consultant? This article is part of a free email course on how to get more customers. Sign up and receive the first lesson now.